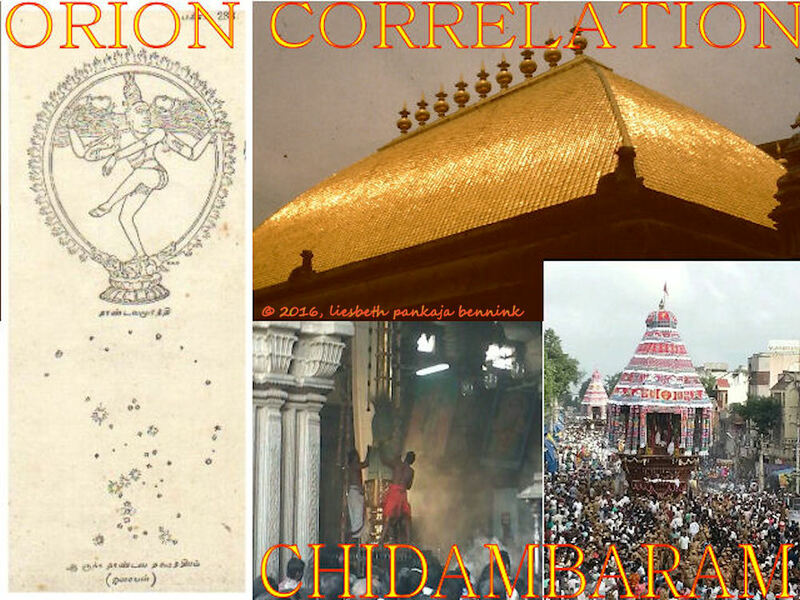 The Orion Correlation in the Nataraja temple in Chidambaram: Arudra Darshanam, full moon in Betelgeuse. Every festival in the Hindu calendar, and especially the festivals of the Shiva Nataraja temple of Chidambaram, are governed by the stars. For many years I was haunted by the connection between the star Arudra (Ardra in Sanskrit) and the main of our twice‑yearly Chariot Festivals, Margari Tiruvadirai. Which is celebrated around the time of the winter solstice of the northern hemisphere. All reasons that I learned from our oral traditions and the texts were not fitting with the performance. I felt there was more. A sacred that had to be revealed, this impulse acted as a spur, urging me on in search of the answer. The question followed me for many years until I found the answer accidentally in an old Tamil book. The master key, which opened the closed door. A door that would lead me to quite unexpected territories, transcending the boundaries of space, time and culture. But that I did not know at the time. It is the night of the 24th to 25th December 1996. It is full moon as well as the night in which Christianity celebrates the birth of Jesus Christ. It is a few hours after midnight. It is also, in a rare coincidence, the night of the moon in Arudra (Ardra), and thousands of people have gathered in the temple square in Chidambaram to witness the main ritual performance of the twice‑yearly Chariot Festival or Ratha Utsava, I stand in their midst and look up. 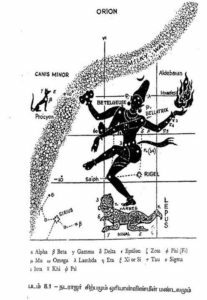 Right over the temple, at the zenith of his path across the firmament, dances the Nataraja high up in the southern sky ‑‑ As the constellation of stars known in the West as Orion. While the attention of the people around me is directed towards the great Hall, only I ‑‑ wandering between earth and heaven ‑‑ se ‘Him’ dancing in the Hall as well as in the sky. My physical eyes are watching ‘Him’ in the Hall. My inner vision is seeing His Dance in the sky ‑‑ Orion. In the frontal part of the building, Shiva Nataraja Murti dances in his earthly embodied form. 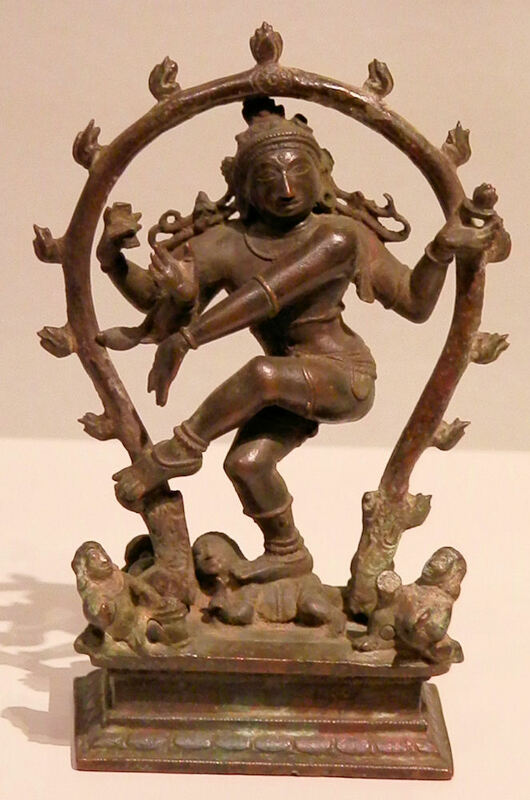 Nataraja, Cosmic Dancer, Lord of Creation and Destruction for his devotees. He is accompanied by his consort Parvati, his sons Ganesha and Murugan, and by the deified saint Chandikeshvara. It is the ninth night of the eleven days festival, and the high priest officiating the festival, is performing the Abhishekam. This is the ablution or pouring of sacred substances on the Murtis or images. Never before have I been so aware of the great significance of my ancestor’s tradition as on this particular night. Of its universality and timelessness, as well as its depth of knowledge and spirituality. 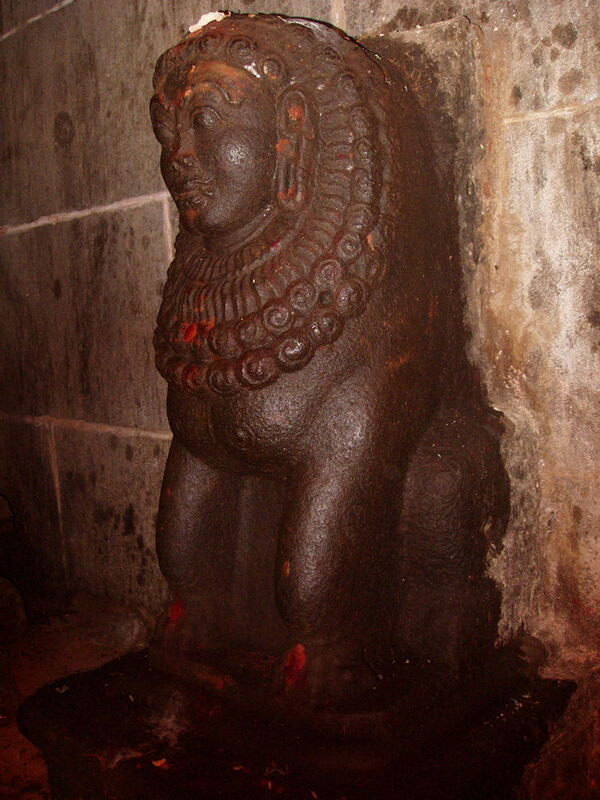 Being a Deekshithar myself, one of the community responsible for the maintenance of the worship of Shiva Nataraja for the past few thousand years, I am well aware that the performance of the Abhishekam of the mid‑winter festival of the temple is celebrated when the moon is in the star Arudra (Ardra). 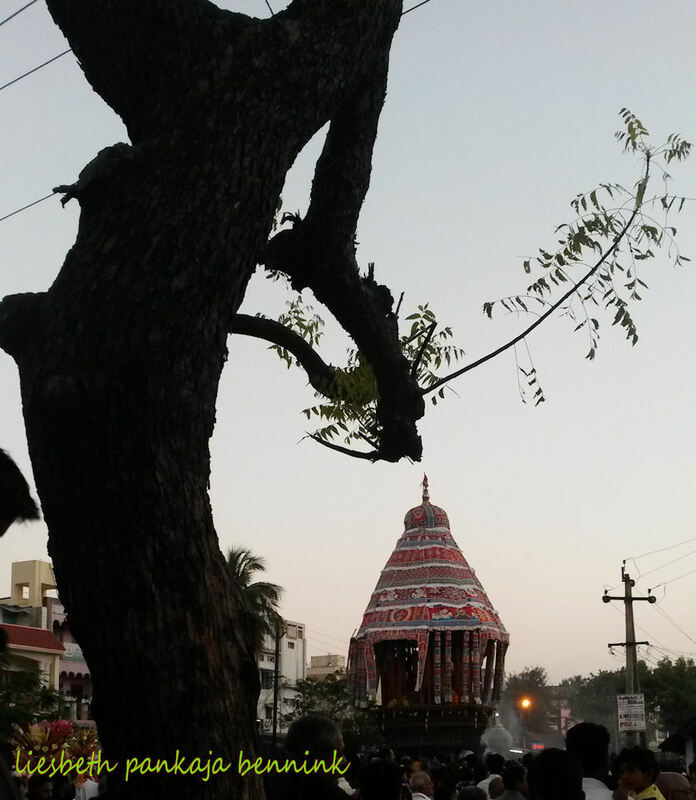 The importance of this can easily be gathered from the Tamil name of the winter Chariot Festival: Margari Tiruvadirai. The holy Ardra in the month of Margari. Margari being the month of the middle of December till the middle of January. In the Tamil calendar this is the month of Dhanus or Sagittarius. My intuition told me long ago that the importance of the performance and the depth of the contexts of the festival were not limited to Hindus or Indians only. But that it had been initiated for the whole of humanity. Proof of this came to me just recently and accidentally. A little less then a year ago I was made aware of the book ‘The Orion Mystery’ by R.Bauval and A.Gilbert through the Dutch media. The authors present in their book a new and innovative approach to the meaning and significance of the Egyptian pyramids. They advocate the thesis that the pyramids build by the fourth and fifth dynasty of Egyptian pharaohs were directly related to the myths and rituals of a star religion. The aim and purpose of this star religion was the repeated recreation of the mythical ‘First Time’ through ritual. And of the recreation of the sacred landscape of the ‘other world’ of the ‘heavens’ on earth in a sacred geography. Thus establishing a ‘gate’, both physically and spiritually linking the earth with the ‘other world’. This ‘gate’ enabled the deceased and mummified pharaoh to be transformed into the god Osiris and to be ‘transported’ to Osiris’ heaven, to become a star. The three pyramids of Gizeh, and the pyramids of Zawyat‑al-Aryan and Abu Ruwash, al build by the fourth dynasty, represent a terrestrial projection of the heavenly image of the god Osiris. Osiris ascended to the heavens after his murder and mummification as the constellation Sahu, now known in the West as Orion. The five stars and five pyramids represent respectively the three stars of ‘Orion’s Belt’, and his left foot and right shoulder (1). While the three small pyramids at Abusir, build by the first three pharaohs of the fifth dynasty, represent the head of Osiris‑Sahu‑Orion. The ‘other world’, called the Duat, where the deceased and mummified pharaoh was transcended or transported towards through rituals, was actually not thought of as a ‘nether world’, placed under the earth, but was situated in the constellation Sahu-Orion in the sky. The sacred geography created by the pyramids on the earth was the Duat or ‘other world’ on the earth (the necropolis of Sakkara near Memphis). This sacred geography also established a ‘gate’, connecting the earthly Duat with the heavenly Duat in the sky, in the constellation Sahu‑Orion. Especially the great pyramid of the pharaoh Cheops played a crucial role in the rituals that transformed the deceased pharaoh into the god Osiris and transported him to his heavenly abode where he became a star. It represents the star Zeta Orionis, the brightest star of the ‘Belt of Orion’. Four shafts running north and south of the so called King’s and Queen’s rooms inside the pyramid were proven to be exactly directed to certain stars in the year 2450 b.c., thus fixing the building date of the great pyramid. The southern shaft of the King’s room was directed to the star Zeta Orionis. The southern shaft running from the Queens room towards the surface of the pyramid was directed to the star Sirius, which represents the consort of Osiris, the goddess Isis. The northern shaft from the King’s room was directed to the star Alpha Draconis, the Pole star at the time of the building of the great pyramids. The northern shaft of the Queen’s room was directed to the star Beta Ursa Minor. These four shafts, rising north and south, two by two, played a crucial role in the rituals that transported the deceased pharaoh to the heavens, where he became a star in the ‘other world’ of the Duat in Sahu‑Orion. Two other pyramids, at Dasjur, are also part of this sacred geography, representing two of the stars of the constellation Hyades. 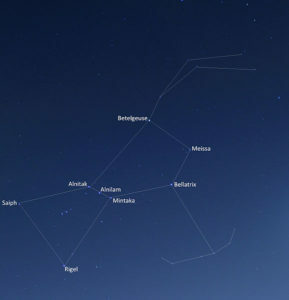 This constellation is connected to Seth, brother and enemy of Osiris. And to Horus, son and avenger of Osiris. So far the thesis of the authors of ‘The Orion Mystery’ (2). Although Hinduism should not be called a ‘star religion’. the stars and planets have always played an important key role in the Hindu cosmology, mythology and doctrine. Indian astrology is possibly the root‑source of all Ear‑Asian astrology. Proof of this we find both in the internal character and functioning of the astrology itself, as well as in the role it has always played in the timing of rituals. All rituals are always performed in the stars that are connected to the presiding deity of the ritual. This practice has been part of the doctrine since earliest Vedic times (3). Indian and Western astrology are based on the same principles, but their practical‑functioning is quite different. Where Western astrology is fully functioning on the basis of the solar calendar, Indian astrology functions on the basis of the lunar calendar. Therefore, besides using the solar zodiac of the 12 signs, Indian astrology also employs the asterisms or lunar mansions, called Nakshatras, which are 27 in number. They are located on or near the ecliptic, and some are part of the larger solar zodiac signs. The moon passes through the Nakshatras during the month, traver­sing approximately one asterism a day. As all Hindu rituals, the Chariot Festivals of the Shiva Nataraja temple of Chidambaram, the temple in whose priestly community I was born and brought up. are fixed according to the solar zodiac and the lunar asterisms. The significant high‑point of the festival is the Abhishekam, or holy ablution, performed during the night between the 9th and 10th day of the festival. The other days of this 11 day festival are fixed relatively to this ritual. The Abhishekam of the mid‑winter festival takes place when the moon is in the asterism Arudra, in the month Margari, which is Dhanus Masam, or Sagittarius. In the western calendar this month falls between the middle of December till the middle of January. Arudra is the Tamil word for the Sanskrit Ardra, which means wet, tender, moist, green, fresh etc. The ancient manuscripts and the oral tradition describe this asterism as one star, and as it having the shape of a human head. In terms of western astronomy it is the star Betelgeuse. In terms of the sacred geography formed by the Egyptian pyramids of the fourth dynasty, as described in ‘The Orion Mystery’, it is represented by the pyramid at Zawyat‑al‑Aryan. The day before the night of the Abhishekam, on the 9th day of the festival, Shiva Nataraja and his consort, the goddess Parvati, are carried by the Deekshithars and the devotees from the sanctum sanctorum of the temple to the great festival chariots, ready and waiting for them in the East Car street. Preceded by their sons Ganesha and Murugan, and followed by the saint and demi‑god Chandikeshvara, they circumambulate the four car streets surrounding the temple. The public pulls the great chariots. In the evening the Deekshithars and the devotees carry the Nataraja and the goddess to the Raja Sabha, the Hall of Thousand Pillars, situated in the north‑.eastern part of the temple. There, from a few hours after midnight till early morning, the Abhishekam is performed. On the 8th day of the festival Shiva appears as Bhikshatana, or Mendicant. This day is celebrated under the Nakshatra Rohini. Rohini is the Red Cow, Mother of all Cattle, of Hindu mythology. She is the ‘Red One’ because the red star Aldebaran is the main star of this asterism that consists of five stars (alpha, beta, gamma, delta, epsilon, Tauri) and is called the constellation Hyades. Rohini is figured by a wheeled vehicle, a chariot or Ratha. The two pyramids of Dasjur represent the star Aldebaran and one of the other stars of the Hyades. 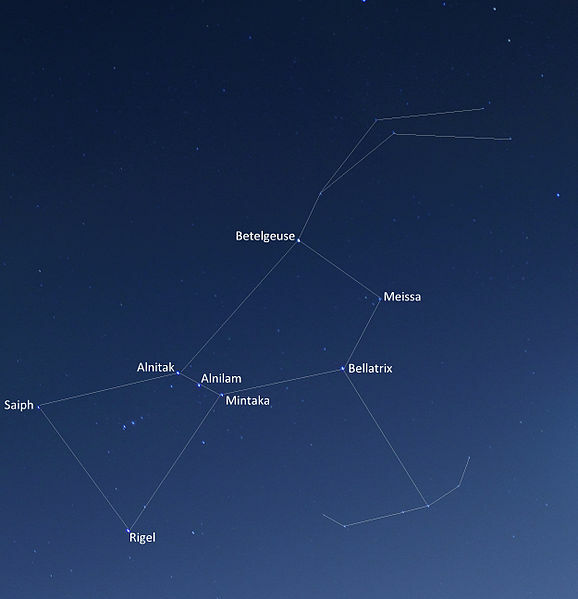 This constellation was mythologically connected to Seth, the brother and enemy of Osiris. As well as to Horus, the son of Osiris. It is mid‑winter and the nights are very cold for south Indian standards. 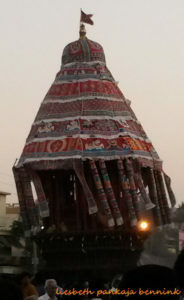 Just unto the beginning of the Chariot Festival Tamil Nadu experienced extreme rainfall after a cyclone. The temperatures are far below normal. Although the people are shivering in the cold, unused, unprepared, and unable to warm themselves in their thin saris and dhotis, thousands have come to see their Nataraja dancing in the great Hall of Thousand Pillars. I stand among them and worship Him as a devotee, and I try to digest what my search uncovered. Nataraja dances in the Raja Sabha, the Hall of Thousand Pillars, while his Abhishekam is performed. This Hall represents the Sahasradara Chakra, the energy point at the top of the skull described as a thousand petalled lotus. He faces towards the south, the only deity to do so. With his right hand, the Hand of Hope, he destroys the fear of death for the humanity. The south being the direction of the god of death. The screen that veiled the mystery of the meaning behind the performance of the festival of Margari Tiruvadirai has been pulled away. And the Chariot Festival, the temple, and Shiva Nataraja have been lifted above their local environment, tradition and significance. They have been shown to transcend the boundaries of space, time and culture. They are now permanently connected to the universal history of the development of human spirituality. The old Tamil book gave me the first key, many years ago. It said the constellation Orion is the Nataraja. The newly discovered meaning of the pyramids of Egypt as described in ‘The Orion Mystery’ gave me a further set of keys. The moon, crossing the asterisms one by one on the significant days of the festival, in a way turns those keys, uncovering new layers of meaning. I have seen the moon traverse the asterisms of Rohini‑Hyades on the 8th day, and of Mriga‑shiras‑Labda Orionis on the 9th day. And now, during the night after the 9th day I see the full moon in Arudra-­Betelgeuse. The old Tamil book showed me the constellation Orion is the Dancing Shiva. The book ‘The Orion Mystery’ revealed to me that the ancient Egyptians worshiped the same Orion constellation on another continent as their god Osiris. Human ritual and technical achievement enabled the land of Egypt to connect with the ‘other world’ through the sacred geography of the pyramids and especially through the great pyramid of Cheops with its shafts. What caused both ancient civilizations, seemingly so far apart in time and space, to recognize their chief deity in this particular constellation? Both deities are seemingly very different. What meeting points are there between them? Shiva Nataraja, Cosmic Dancer, dancing his. five activities: Creation, Preservation, Destruction, Illusion and Salvation, in the temple of Chidambaram in south India. And Osiris, ancient Egypt’s god of rebirth and fertility. The one who brought civilization to the ‘Egyptian people in the mythical ‘First Time’, when he was their king. Later murdered by his brother Seth and resurrected by his consort the goddess Isis. And succeeded by his son Horus. Was it just the consequence of Orion’s shape and prominence in the sky? Were there possibly historical connections’? Or were there deeper, as yet un‑known and more mysterious reasons? Do both deities somehow represent the same energy or cosmic principle? Shaped into different words and images by the mythologies of both lands and peoples. The mythology of Osiris speaks of him as the great king of the ‘First Time’. Bringer of civilization, god of fertility and rebirth. And ruler over deceased souls in the ‘other world’. Nataraja shows and creates the whole universe through dance. Dance is the first symbol of human civilization. And he is Raja‑di‑Raja, King of Kings, and Emperor of the Universe. 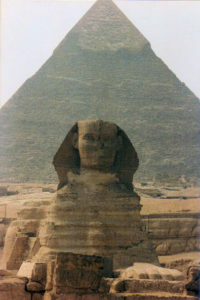 The three pyramids of Gizeh are ‘guarded’ by the Great Sphinx of Gizeh. Its gaze marks the sunrise, and thus the zodiac, through the ages. No one now knows why it was built on that spot, on such a scale, or what its functions and meaning were to the people who once build it. The Great Sphinx is a well-known image to people from all over the world. Less well known are the two pairs of sphinxes that once guarded the entrances to the temple of the pharaoh Chefren. This temple is situated in front, and slightly to the south of the Great Sphinx, at the end of the ancient passage way which leads from the pyramids to the Sphinx and the temple complex located there. These two pairs of sphinxes, which face each other, and the temple they guard were build at the same time as the pyramids and are unique. The Nataraja temple in Chidambaram is the only temple in India, as far as I have been able to ascertain, whose entrance is guarded by a pair of sphinxes (6). As we enter the temple of Shiva Nataraja, the main shrine within the complex, through the east entrance, we descend the 21 steps that lead into the heart of the temple. There, on either side of the entrance, on a raised platform, our eyes meet those of the sphinxes. They are called Purusha Mukha (human‑face), or Purusha Mriga (man‑wild beast). Their lion bodies are sitting in an upright, watchful) position. Their human faces surrounded by full manes. They are part of the ritual practice of the temple, and people burn lamps for them. They purify those devotees that look at them, upon entering, by removing their sins. The one on the southern side of the entrance is a male Purusha Mriga or sphinx. He wears a ferocious expression on his human face and has a pair of sharp fangs. The one on the northern side is a female sphinx. Her expression is one of tranquility, and she has no fangs. Although they are sculptured in a style that is uniquely Indian, it is not possible to classify them in any of the three main styles of medieval southern India: Chola, Pandya or Pallava (after the three main dynasties of the period). They are unique in style, expression and structure. The front of the bodies and the faces of the Purusha Mrigas are sculptured with great care and in detail. The sculptors have given them the appropriate male and female ear‑studs in their elongated ear‑lobes. But the hind part of their bodies have been left unsculptured. These are incorporated in the great wall of enclosure that surrounds the shrine. This wall is called ‘Vikrama Cola Tirumaligai’ after the Chola king who build it. He ruled between 1118 and 1135, thus fixing a minimum age for these Purusha Mriga. But the mythology and tradition tell of them having been there from prehistoric times onward. From the very origins of the temple. Legend has it they first guarded the great ritual fire sacrifice performed by the Pandavas, the five heroes of the Epic Mahabharata. This was called Rajasuya. After the conclusion of the ritual the Purusha Mriga asked what they might do, now their task was concluded. They were told to go to Chidambaram, where Shiva was one day going to perform his Cosmic Dance for the humanity. Their task would be to purify the devotees visiting the temple. They face inwards, towards the shrine of Nataraja. And right in front of them, carved in the ceiling is a sculptured zodiac. Just as the Great Sphinx of Gizeh is watching over the actual heavenly zodiac. The Purusha Mriga that guard the east entrance are conscious­ly in the people’s minds. They are worshipped, and butter lamps are always burning in front of them. And from time to time, accor­ding to the temple’s routine, rituals are performed I for them. But not far away, in another part of the temple, I found many more Purusha Mriga (7). Long forgotten and unnoticed by both priests and devotees, as well as by the many scholars who visit this famous temple. From the entrance with the 21 steps we turn left, and follow the pillared gallery in the clockwise direction. At the center of the southern corridor we emerge from the shadows into a courtyard area open to the light of the sky. There our eyes are arrested by an imposing pillared edifice. A pavilion in the form of a stone chariot, with two giant stone wheels, drawn by two yoked stone horses. This is the Nritya Sabha, or Dance Hall, site of the mythological dance contest between Shiva and the goddess Kali. Drawing closer, we see beautifully sculpted panels filled with the intriguing figures of hermaphrodites, musicians and exuberant dancers, lining the base of the structure. Raising the eyes slightly and coming still closer, we forget even to blink, as hundreds and hundreds of miniature dancers, mythological figures and mysterious symbols come into focus. These cover the pavilion’s massive twelve foot high pillars, each one carved in intricate detail on the granite columns. Dropping our gaze once again to the sculpted face of the plinth, we see that it is adorned with a number of layers, each with its own repeating motive. Just above eye‑level, on the top patika or belt, unfolds a breath-taking scene: a row of reclining sphinxes, alternating with lions, wrapping around the front part of the pavilion. These sphinxes face the golden flag mast, which has a similar position in the temple structure as the Egyptian Obelisk. Following their gaze beyond this flag mast, we enter, through a high doorway, the innermost courtyard of the temple. Just here, above the spot from which one can see both the Dancing Shiva, straight ahead, and the Dreaming Vishnu, off to one side, we find the twelve signs of the zodiac sculpted into the ceiling. Again under the gaze of the sphinxes. Sitting peacefully in their prominent and elevated position, they also witness, as they have witnessed for centuries, Shiva’s Shanti Kuttu ‑‑ the Cosmic Dance of Peace ‑‑. And are filled with his eternal bliss. Following the row of sphinxes to the west, we come to two forms of Shiva in elevated niches projecting from the side of the Nritya Sabha. One facing north and the other facing west. Both murtis, or images, are flanked by pairs of elegant pillars, which support the roof of the niches. And at the base of each pillar again we find a sphinx. Male on one side and female on the other, these four sphinxes stoically support the pillars. And although all have fangs, they guard Shiva with expressions of peace and benevolence. Although much about these sculptures is totally unique ‑‑ their place in the structure of the building, the style of the sculptural work, their jewelry, hairstyle and facial expressions‑still they exhibit the unmistakable form of the sphinx: s human with a lion’s body. And even though their position is prominent, these sphinxes seem to go unnoticed by the visitors, and their resemblance to the sphinxes of Egypt has never, to my knowledge, been pointed out until now. In the book ‘The Orion Mystery’ the authors describe how the ancient Egyptians perceived the ‘other world’, called the Duat, to be situated somewhere in the constellation of Orion. To this ‘heaven’ the spirits of the deceased pharaohs were transported through rituals, where they became stars. They also described what they thought the function was of the shafts in the great pyramid of Cheops. Connecting the mythology and the rituals with the stars to which the shafts were directed at the time of the building of the pyramids: the two southern shafts to Sirius and the ‘Belt of Orion’. The two northern to Beta Ursa Minor and to Alpha Draconis, the Pole‑star at that time. In the Vedas, the oldest texts of Hinduism, the stars, the Nakshatras are considered as the abode of the gods and of pious persons after death. The sacred texts of the Hindus also speak of the Seven Lokas, or worlds, situated one above the other. Bhur Loka is our earth, inhabited by humans, Bhuvar Loka is the space between the earth and the sun, inhabited by Munis (wise men), Siddhas (sorcerers) etc. Svar Loka is the heaven of the god Indra and is located between the sun and the Pole star. Mahar Loka, a region above the Pole star, is inhabited by Brigu and other saints who survive the destruction of the three lower worlds. Janar Loka is inhabited by Brahma’s son, Sanat Kumara. Tapar Loka is inhabited by deified Vairagins (those who have freed themselves from all worldly desires). And Satya Loka or Brahma Loka is the abode of Brahma, translation to which exempts from rebirth. The author of the old Tamil book describes Nataraja‑Orion as surrounded by three Lokas. He mentions them with the names of the Cosmic Trinity; Brahma Loka, Vishnu Loka and Shiva Loka. While Svar Loka and Mahar Loka are connected to the northern sky and the Pole‑star‑by their own descriptions. The stone Ratha or chariot is situated opposite the sanctum. It is as though Nataraja has just arrived on his chariot, descending from heaven to earth, and ascended into the sanctum with the Golden Roof to bless us with the experience of his dance. The Chariot Hall is the oldest building within the complex after the sanctum itself. All announcements by Indologists as to its age are merely guesses. And it is also not known what its original function may have been in the doctrine of the temple. The asterism Rohini that is figured as a Ratha is also situated in front of Orion‑Nataraja in the sky. The wooden festival chariot is the Vahana or transport of the Nataraja on the 9th day of the festival, celebrated under the asterism Mriga‑shiras. Traditionally this is translated as ‘deer’s head’ and this has its own meaning and mythology. But Mriga‑shiras can also be translated as ‘seeking or reaching the pinnacle or summit’. The wooden chariot is shaped as an inverted step pyramid and represents Meru, the Cosmic Mountain. After the chariot with Nataraja has returned to its starting point in the late afternoon, the image of the great poet‑saint Manikavasakar is brought from the temple to worship the Dancing Shiva. This ritual is only performed during the winter festival. The following day Manikavasakar comes again, to see his Lord and Goddess return to the sanctum from the Thousand Pillars Hall, after which he attains ‘Moksha’‑‑ Liberation. The legend of this saint tells that he entered the sanctum and disappeared, transported bodily to ‘heaven’. This event is connected with the winter festival. Manikavasakar is thought to have lived in the 5th century ad. Several saintly people are known to have ‘reached the pinnacle’ and achieved ‘heaven’ in the body, through the sanctum of Nataraja in Chidambaram (8). The Nataraja temple is the only temple in India that celebrates two Chariot Festivals every year. One is performed in midwinter and one in mid‑summer. The mid‑summer festival is called Ani Tirumanjanam. The holy Abhishekam in the month of Ani. This is the month between the middle of June till the middle of July. The Abhishekam is performed under the Nakshatra Uttara Phalguni. Ancient texts state that this Nakshatras is the equivalent of Dhruva, the Pole star. At the time of mid‑summer the northern constellations of Ursa minor, Draco and the present day Pole star will be prominent in the northern sky. The association of Uttara Phalguni and Dhruva, the Pole star and the position of the northern constellations at the time of the mid‑summer Chariot Festival, establish one more connection between the living traditions of the Chidambaram temple of Shiva Nataraja, and the religion of the pyramid builders in ancient Egypt. To conclude this article I want to point out one more conclusive connection between ancient Egypt and our living tradition. My temple is one of only two temples from all over India where the Vedic tradition is practiced through an unbroken, oral, tradition. At the center of the Vedic doctrine stands the fire‑sacrifice. This is performed in a fire‑pit that has the shape of a flattened, inverted step‑pyramid. The earliest Egyptian pyramids were also shaped as flattened step‑pyramids. The procedure and effect of the ritual is based on the presence of an energy point in every pyramid. This is now well established in the Wets as well through experiments. The energy of the sacrificial substances, together with the energy of the mantras, of the fire itself, and the energy of the performer towards the ritual, all taken together constitute the transformation and transport of the essence of the energy to the ‘other world’. Resulting in Punyam, or merit, for the person or purpose in whose name or function the ritual is performed. –Two great deities from different times and different continents intimately linked together by their identity with the same constellation of stars, now known as Orion. ‑‑ the ‘sacred geography’ constituted by the pyramids of Gizeh and others in northern Egypt, reconstituted by the three high‑days of the mid‑winter Chariot Festival of the Nataraja temple of Chidambaram in southern India. Rohini‑Hyades‑pyramids‑of Dasjur; Mrigashiras‑Labmda Orionis (and two other stars)‑pyramids of Abusir; Arudra‑Betelgeuse‑pyramid of Zawyat‑al‑Aryan. 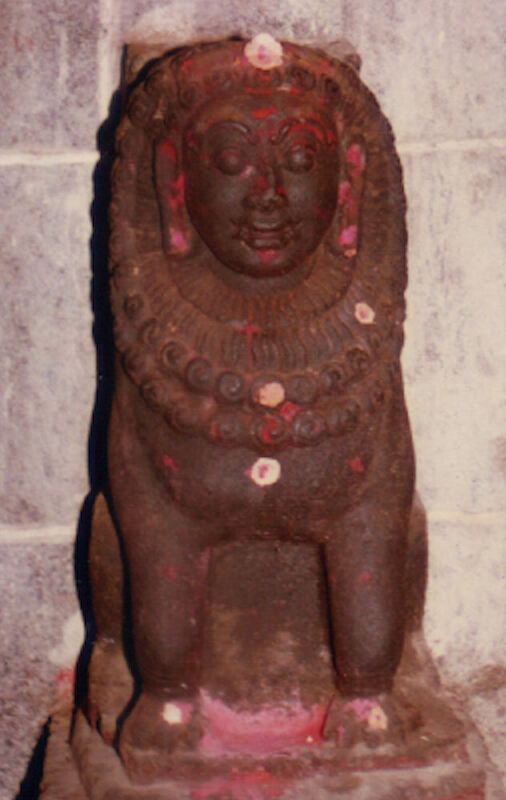 ‑‑ a unique association of the Chidambaram temple with Purusha Mriga or Sphinx. ‑‑ Extra ordinary people known to have been transported to the ‘other world’ in the body or in the spirit through the pyramids and through the sanctum sanctorum of the Chidambaram temple. Were the pyramids of Egypt really build as grave monuments for dead pharaohs? No mortal remains were ever found in them. Were the pyramids used by initiates to travel to ‘the other world’ and back, in the spirit, or possibly even in the body? To gain knowledge and wisdom? Or did the initiated elite of the fourth dynasty, led by their pharaoh and inspired by the high‑priest‑astronomer and architect of the pyramids Imhotep, transfer themselves to ‘the other world’, by a combination of technology and spiritual achievement. It is known that after the completion of the ‘sacred geography’ at Gizeh, the fourth dynasty collapsed and its technical knowledge and organizational power disappeared. Of coarse this possibility will be considered ridiculous in this scientific age. Spirituality and spiritual achievements are now explained as functions of the chemistry of the brain. The entire achievements of human consciousness reduced to a few chemical formulas. Our wise ancestors would have thought this possibility ridiculous. What is the strong connection between Osiris and Orion, and Nataraja and Orion? Does Orion somehow emit a special energy? Are the murtis, or physical forms, of Osiris and Nataraja the shadows or projections of this energy on our earth? Or does Orion receive energy through the subtle radiance of the murti of Nataraja through the Abhishekam, or ablution. Further research may give us the information necessary to reach any definite conclusion. Information from the living tradition of Chidambaram may shine a further light on many of the mysteries surrounding the Egyptian pyramids, the Sphinx, and many other aspects of the Egyptian civilization. After all in Egypt much was destroyed, especially the oral tradition, many centuries ago. But anybody who would like to experience ‘The Orion Mystery’ can come to Chidambaram to celebrate Margari Tiruvadirai, the midwinter Chariot Festival of Shiva Nataraja. They can see the full moon traverse the stars of Rohini, Mriga‑shiras and Ardra in December‑January. Seek the pinnacle of the Cosmic Mountain, and witness the Cosmic Dance of Nataraja on the chariot. See Nataraja and the Goddess dance in the Sahasradara Chakra, the Thousand Pillar Hall. And become transported to ‘Heaven on Earth’. * This article was first published in the Dutch magazine Bres in 1999. (1) The authors of ‘The Orion Mystery’ identify the pyramids of Abu Ruwash and Zawyat‑al‑Aryan with the stars Saiph and Bella­ trix respectively. But from their own descriptions, their maps and graphs, and from the star map (Die Sterne, Hallwag Publi shers, 21st edition, 1988) and the actual situation observed by me in the sky, I have come to the conclusion that the stars Betelgeuse and Rigel are represented by a pyramid, and not the stars Saiph and Bellatrix. Saiph and Bellatrix could only be identified with the pyramids of Abu Ruwasj and Zawyat‑al Aryan if the image of Orion was, as it were, ‘mirrored’ along it’s north‑south axis. But then the identification of the pyramid of Cheops with the star Zeta‑Orionis would be incorrect. And the image of Orion‑Osiris projected on the Orion in the sky, holding Rohini‑Hyades in his left hand (illustration 16 of Dutch edition) would not be in correspondence with the descriptions and identifications made in ‘The Orion Mystery’. (3) Most western scholars’ assumption that Indian astrology was de­ rived from Greek astrology in the third century ad. shows a complete ignorance of astrology in general and of Indian astro­logy in particular. (4) R.N.N.Deekshithar M.A., ‘Reisden de Sphinxen naar India? Bres 179, Augustus‑September 1996, p 76‑82. (5) For more information on the meaning behind the symbolism of the temple architecture, of the Chariot Festival and of the daily rituals of the Shri Nataraja temple of Chidambaram, I recommend to the interested reader my book ‘The Hidden Treasure in the City of Ether‘. (6) Heinz Demisch, ‘Die Sphinx. Geschichte ihrer Darstellung von dem Anfangen bis zum Gegenwart‘ Stuttgart 1977. The material gathered in this book shows the sphinx has almost no presence in India, except for one or two examples from Buddhist monuments in the far north. (7) Besides the sphinxes of the Nritya Sabha, I have since found several more Purusha Mriga in other parts of the temple. (8) Generally many people in India are known from legend to have gone to ‘the other world’ in the body. Besides many more having reached ‘Moksha’ or Liberation in the Spirit, leaving their mortal body behind.